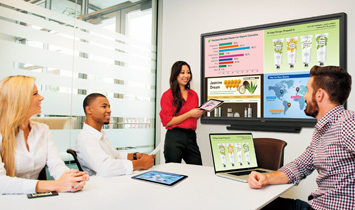 PN-70TW3/60TW3 has a built-in wireless controller that enables multiple devices—including Mac® or Windows® computers, smartphones, and tablets—to connect wirelessly via dedicated connection software. Mac and Windows users also have a handy option for quick, temporary connection: they can launch the wireless connection software on the bundled token without pre-installing anything. Thanks to wireless connectivity on the PN-70TW3/60TW3, meeting participants can bring their own devices (BYOD) and enjoy speedy and active communications. The PN-70TW3/60TW3 features a pen digitizer function* that automatically distinguishes pen and finger input, allowing you to perform pen and touch operations without having to switch modes. The bundled touch pen employs a pressure sensor that faithfully renders your writing style. The pen digitizer function is compatible with Microsoft Office (Excel, Word, PowerPoint, OneNote®), Adobe Photoshop®, Adobe Illustrator®, and SHARP Touch Viewing Software. This software is especially effective for communications with large audiences. 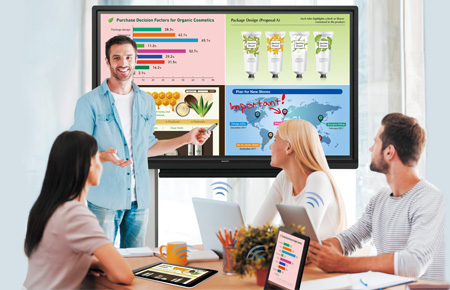 By allowing the BIG PAD to share its onscreen content with up to 50 devices*, and by enabling the exchange of files between those devices, SHARP Display Connect facilitates lively discussions and paperless meetings in both business and educational settings. * The number of connectable mobile devices depends on the host OS and the accompanying Windows End-User License Agreement: Windows 7: Max. 20; Windows 8/8.1, Windows 10: Max. 50. OS requirements (as of November 2015): Host: Windows 7, Windows 8/8.1, Windows 10; Client: Windows 7, Windows 8/8.1, Windows 10, OS X v10.7–10.10, Android 2.3–5.0, iOS 6.0–8.0. Connecting 26 or more mobile devices requires at least two LAN access points.